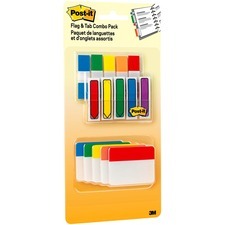 Post-it Flags and Tab Combo Pack includes the essentials for work on projects, research and more. Vivid assorted colors are perfect for color-coding. Use Post-it Flags to mark vital details in documents and Post-it Durable Tabs to create sections and divide projects. 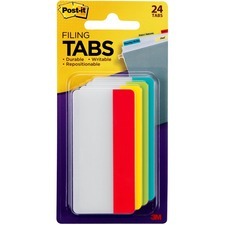 Extra thickness of the Post-it Durable Tabs prevents wear and tear. They are easy to write on, apply and reposition. 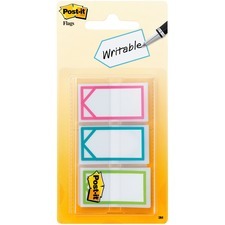 Post-it Flags and Tabs are easy to write on, stick securely and remove cleanly. Set includes 100 flags, 100 flags with pre-printed arrows and 30 Durable Tabs. Post-it Durable Tabs make it simple to index, file, organize, store and retrieve documents, and display an organized and professional image. Tabs are tough and long-lasting. They withstand repeated use. Tabs are easy to write on, apply and reposition. Design offers plenty of space for labeling. Included dispenser dispenses one tab at a time. 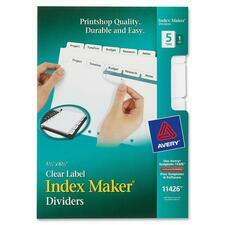 Stay organized by customizing different sections of your 5" x 8" planner or binder with Mini Index Maker Dividers. Clear labels virtually disappear when applied to tabs. Easy Apply label strips help you center and apply labels to all tabs at once so you save time. Create labels for the front and back of the divider tab with just one click using a free, online Auto-Fill template, and then print them with a laser or inkjet printer. Each divider is seven-hole punched for planners and mini binders. Durable, reinforced tabs and binding resist tearing and stand up to frequent use. These little dividers may be small in size, but they're big in helping you get organized in no time. 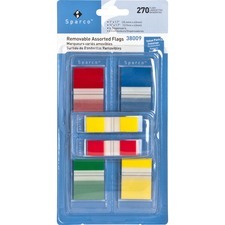 Colorful, self-stick flags mark important information in documents, books, newspapers, or magazines. Clear side of the flag can be used for writing notes with ballpoint pens or permanent markers. Flags are removable and reusable. Flags are dispensed one at a time with the included dispenser. Each dispenser contains 50 flags. Use removable flags anywhere you need to attract attention. 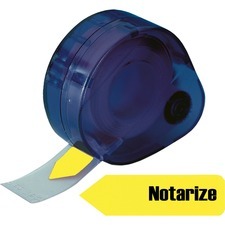 Simply apply "Notarize" flag where needed and remove the flag when the task is finished or the reference is no longer needed. Can be written on. Dispenser can be refilled. Removable Flags Combo Pack includes removable 1" and 1/2" flags in pop-up dispensers. Transparent flags feature self-stick, removable adhesive. Flag design is half color and half clear. Flag kit includes four dispensers with 50 1" flags each and two dispensers with 35 1/2" flags each. 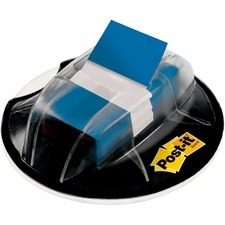 Post-it Flags come in a lightweight dispenser that grips to the desk without adhesive for convenient one-handed dispensing. 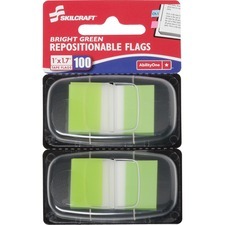 Post-it Flags make it simple to mark your place, flag or highlight important information. Use them to draw attention to critical items, index, file or color-code. Eye-catching, colorful flags are easy to spot and have space to write. Removable adhesive allows the attention-getting 1" flags to stick securely, reposition and remove cleanly. Removable page markers are ideal for color-coding materials by topic, reader, importance and more. Removable adhesive lets you reposition them and does not damage original documents. Assorted bright colors include yellow, green, pink and purple. Each pad includes 40 page markers. 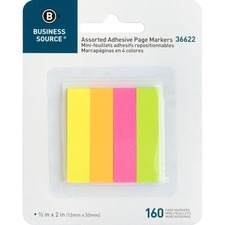 Post-it Arrow Flags make it simple to direct attention to precisely what is important on a page or find your exact spot. The large writing surface accommodates notes and instructions for easy indexing, filing and labeling. Flags are ideal for marking documents without writing on them. Removable adhesive allows the attention-getting 1" flags to stick securely, reposition and remove cleanly. Brightly colored outlines on white, bold arrow points precisely where you need it. Flags come in a handy, clear plastic dispenser that pops them up one-at-a-time. They conveniently go in a desk drawer, briefcase, backpack or purse and are available when needed.